While at the hardware store earlier this week, getting distracted with these elbow pieces, I also managed to pick up some manila rope. For some reason as soon as I saw it I thought it would work well with a Christmas light strand. 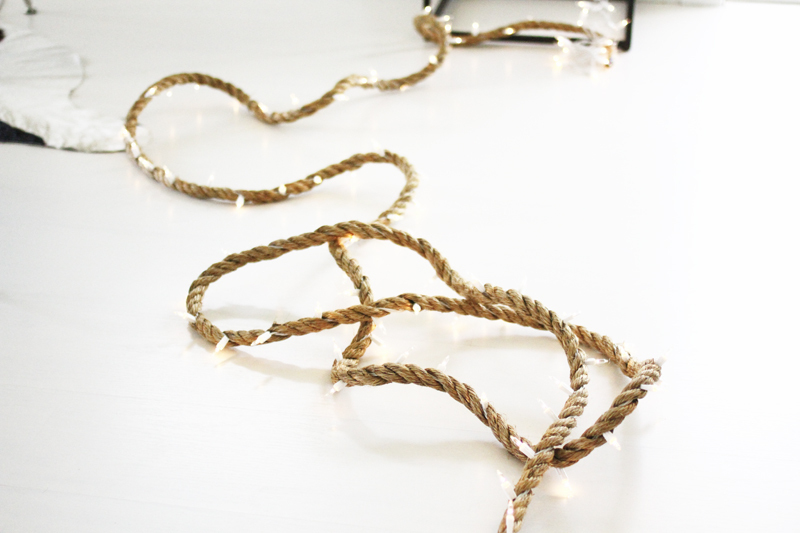 The braid is easy to pull apart so I bought enough to cover the length of a long Christmas light string. Begin with the female end of the light strand, weave it in with the rope by twisting the rope in the opposite direction of the braid. 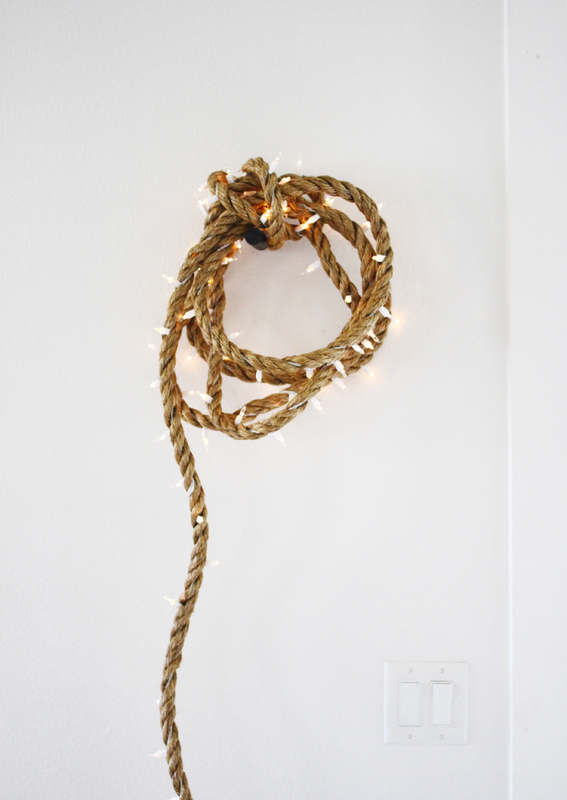 Continue to do this for the length of the rope until almost the entire string of lights has been twisted into the rope. 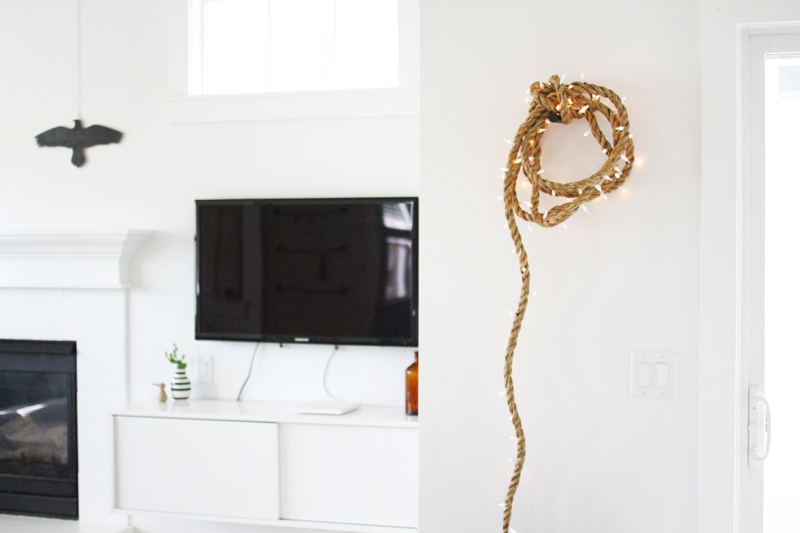 You can wrap it up in a circle like I did and hang it on yesterday's DIY hook or set it on a bookshelf or even the floor. I'm sure you could even use different kinds/colors of rope but I prefer this natural fiber myself. I love this because it can definitely be used as Christmas decor or just used year round! So fine and wonderful combination, thank you for the brilliant inspiration! I can't tell you how excited I am for this DIY tutorial! I have so much rope left over from J's birthday party and now I know exactly what I want to do with it! Saw it on your IG feed and had to come check it out! What a creative idea. It looks lovely! Ps. I am so happy I found your blog. Absolutely love it! Absolutely love this! Looks fantastic! 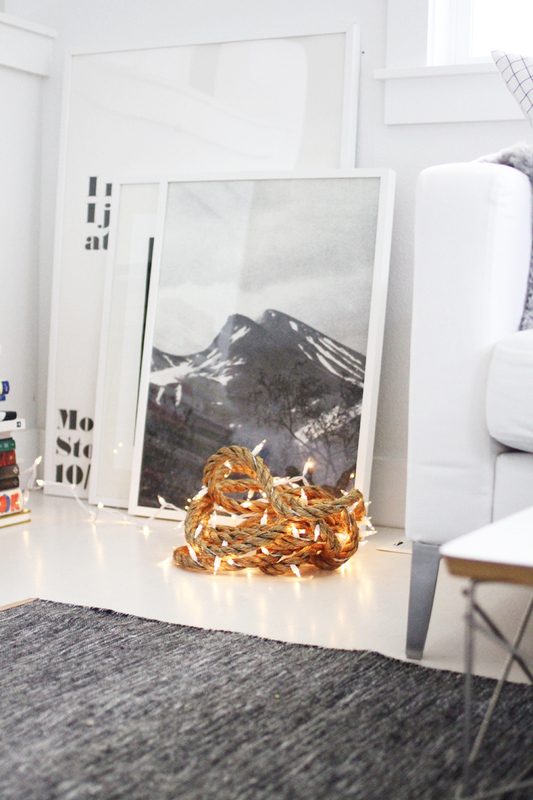 It is do fine :-)I love your mountain poster, where is it from? I second this question about the mountain poster. Love it. I love that!!! What a great idea! Will definitely have to try this myself. Thanks!! 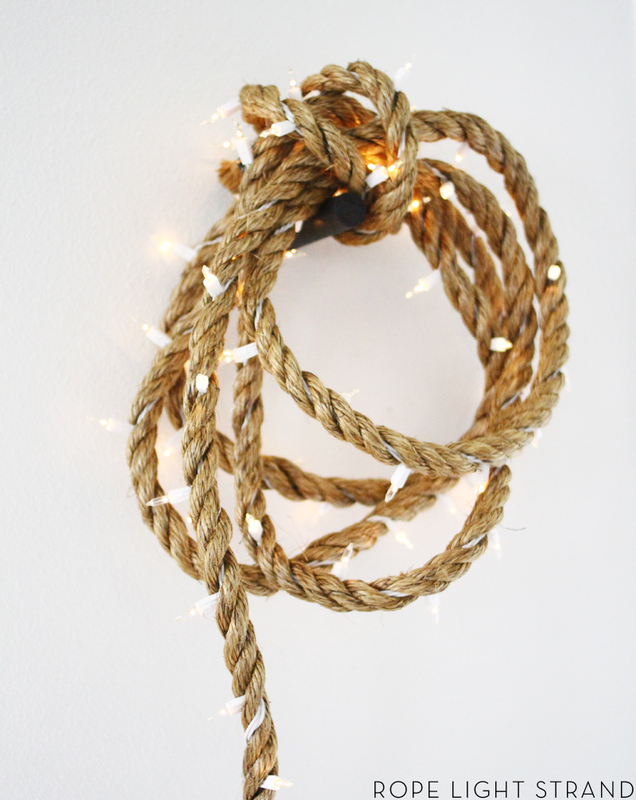 I am obsessed with this DIY and will definitely be trying it out for my front hall. Lovely! female end of the light strand...?? What is that exactly? When talking about an electrical cord with two types of outlets, each end is commonly referred to in terms or gender-the side with the holes is called a female end and the side with the prongs is the male end. You can google it as well. I also love the mountain poster. Where did you get it? Fine Little Day, Elizabeth Dunker's shop. We've had it for a few years now but I still love it! I love the look and texture of this ! Maybe I'll try, if the weaving isn't too difficult ! This looks like nothing I've seen before (in a good way, bien sur). It's going straight to my winter crafts board on Pinterest. Beautiful! I love how simple this DIY is, it came out so nice! This is wonderful. I love LOVE love rustic + modern decor. Beautiful photographs as well! How thick would you guess the rope you used is? Love this! Definitely going to give it a try! I just did this yesterday. 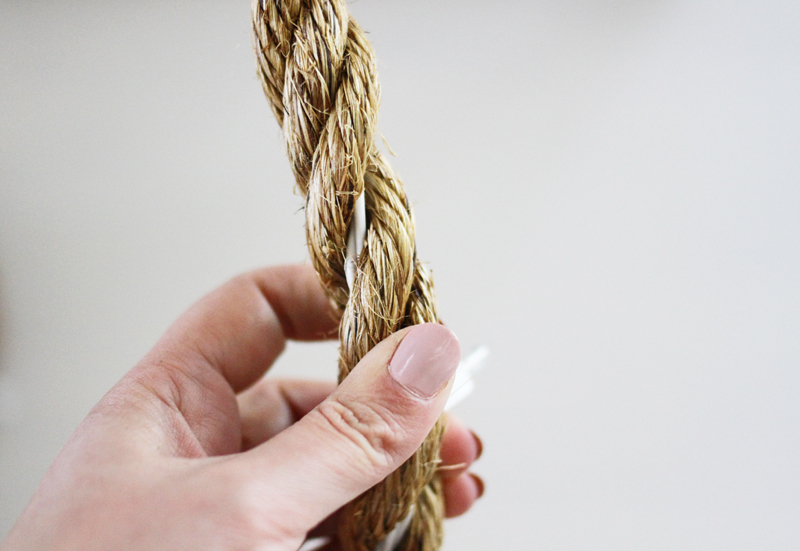 The rope is rough on your hands but it does give you a nice rustic finish. Unfortunately I didn't have any white lights so I made do with green ones. I am planning on using this all year long. At night, it looks like the rope is on fire. I would strongly recommend that if you are to do this to whip both ends when you are done so the rope does not unwind itself.